﻿A real LOVE letter Bv: iomvdizzle	Ftafl ■ ROSES ARE RED,	NUTS ARE ROUND,	\ ^ SHIRTS R UP. / next PANT,ES R DOWN,	SELLV TO 8EUY,	SK.IN TO	WHEN ITS STIFF,	^^^^■stick it	|how thats a mmc love poem*	havent posted sDmethin in sges! 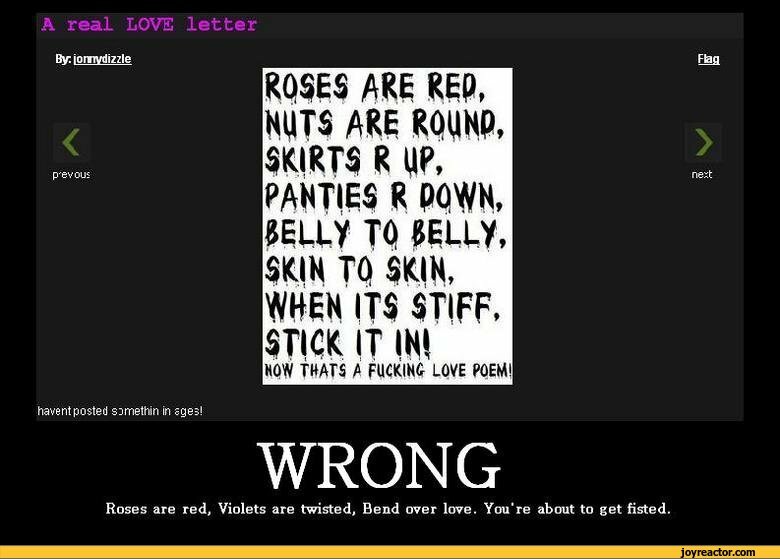 WRONG Roses are red, Violets are twisted. Bend over love. You’re about to get fisted.